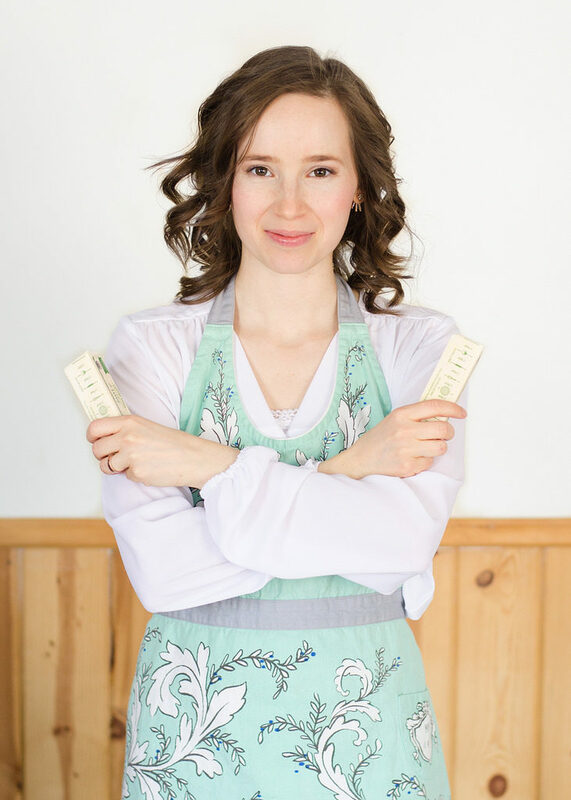 If you’re a long-time reader of Buttered Side Up, you know that I’m a fan of ButcherBox. 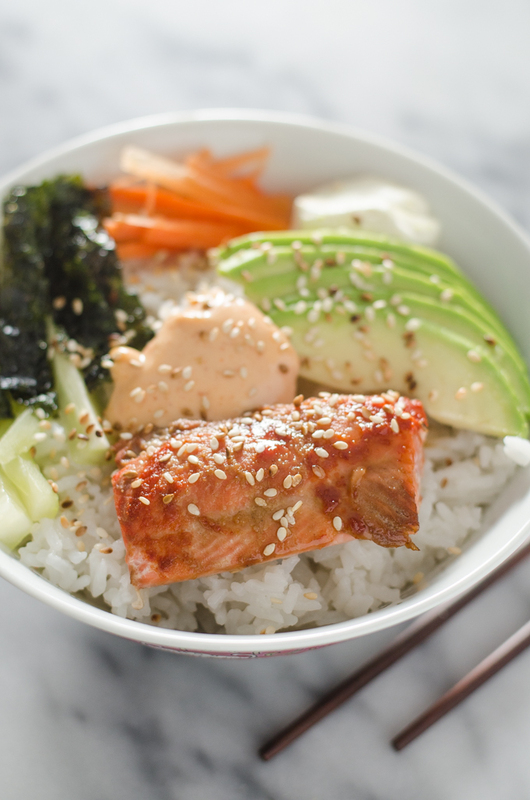 So when they announced that they were releasing a wild-caught salmon box, of course I wanted to try it out for you guys! 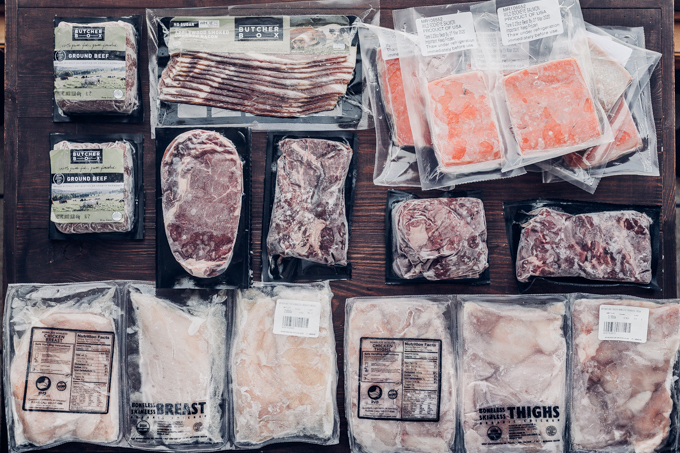 ButcherBox is a subscription service that delivers 100% grass-fed and grass-finished beef right to your front door. They also have options to include organic chicken and heritage breed pork. And of course now they’re adding the option of wild-caught salmon! By the way, you can always customize your box so that it comes once a month or every other month. So convenient! BTW, I chose the beef, chicken, and salmon box. I think my box was slightly larger than a standard box, so keep that in mind when ordering. This was just a day or two before I started Sugar Free January, and I knew I wanted to get some sushi bowls in before the start (sushi rice is flavored with vinegar, sugar, and salt). I baked the wild caught salmon with salt and a drizzle of sriracha. Yum! I served the bowls with avocado, cucumber, seaweed snacks, carrots, cream cheese, and sriracha mayo. Definitely going to make these again after SFJ! 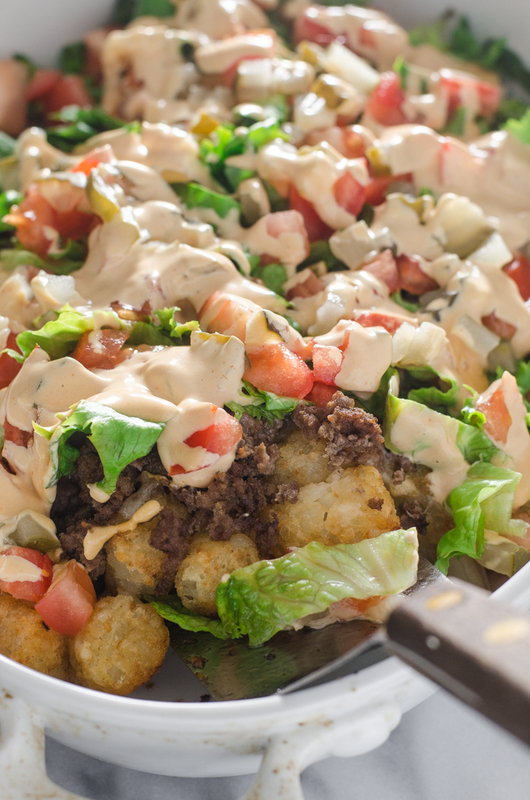 Cheeseburger Totchos! Actually, I intended to make this meal before SFJ as well, but life happened and I didn’t get around to it. I used the ground beef from my ButcherBox. These were really good, as always. I was able to use an unsweetened ketchup, so the only real cheat here was a tiny bit of apple juice concentrate in the tater tots to promote browning. 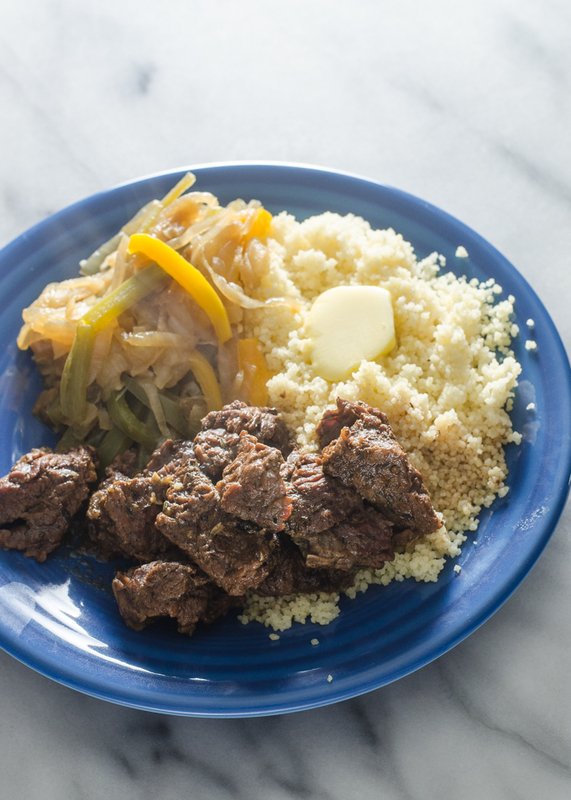 With the steak tips I made: Instant Pot steak tips with couscous (topped with butter) and fried onions and peppers. Yummers! We had enough leftover steak tips, couscous, veggies, and ground beef (from the totchos meal) that we were able to get a second meal out of it! One of my favorite things to make for supper is breakfast! 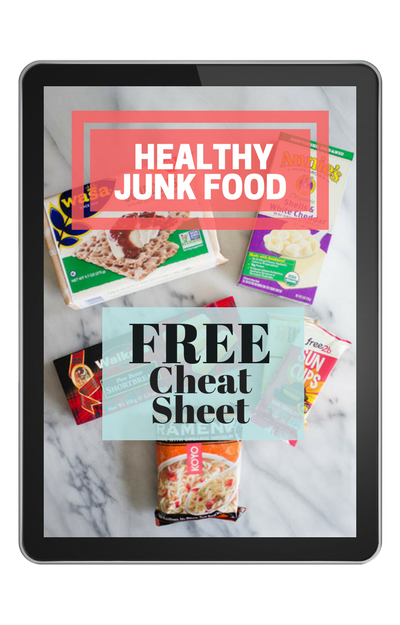 I love that the ButcherBox bacon is sugar free – perfect for SFJ! 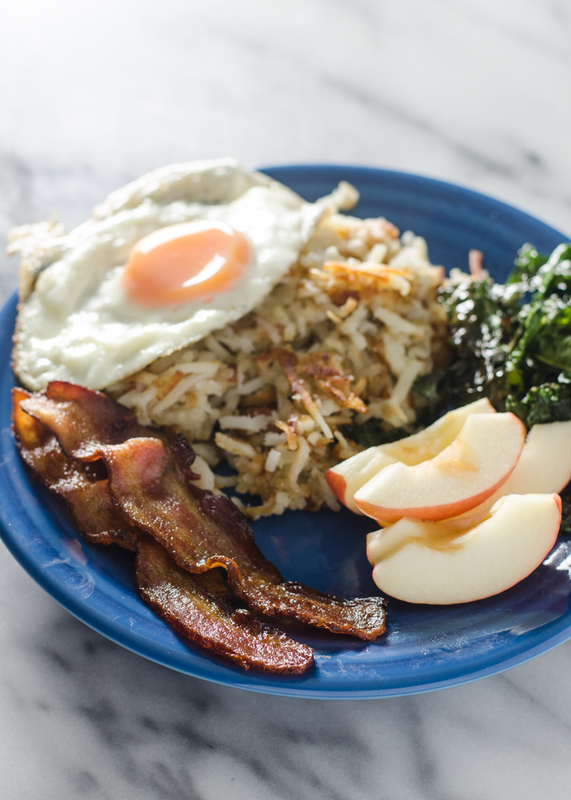 I cooked it in the oven (the best way to cook bacon) and served it alongside hash browns, fried eggs, kale chips, and pink lady apples. With part of the chicken breasts that I got in my ButcherBox, I made Greek chicken rice bowls. 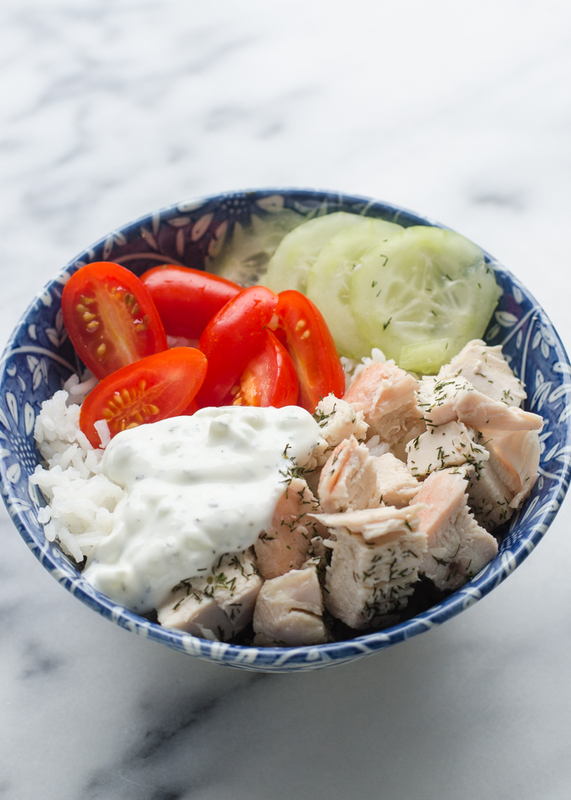 I put some rice in a bowl and topped it off with tomatoes, cucumbers, baked chicken (sprinkled with dill), and a cheater tzatziki sauce. 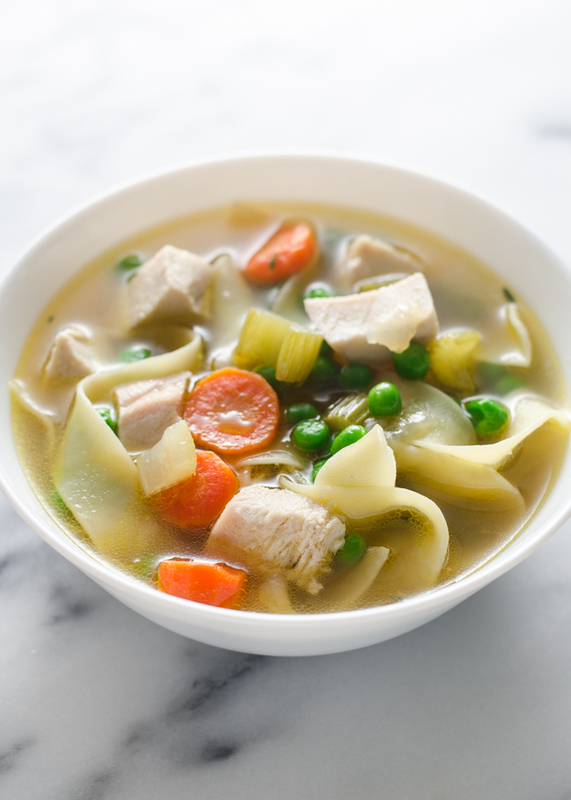 This was lunch for the kids and I.
Aaaah…there’s just nothing like homemade chicken noodle soup! With the remaining chicken breasts I cook up a big batch of soup and froze half for when the baby comes. 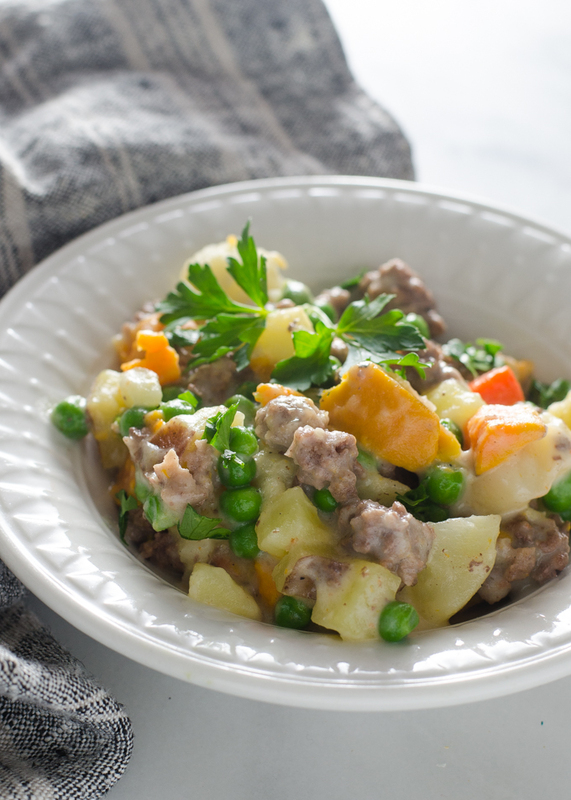 With the second package of ground beef I made a beef + veggie casserole. I basically boiled up some potatoes, sweet potatoes, carrots, and parsnips, browned the ground beef, and then made a roux from chicken broth, milk, and cream. Then I mixed it all together and baked until bubbly. 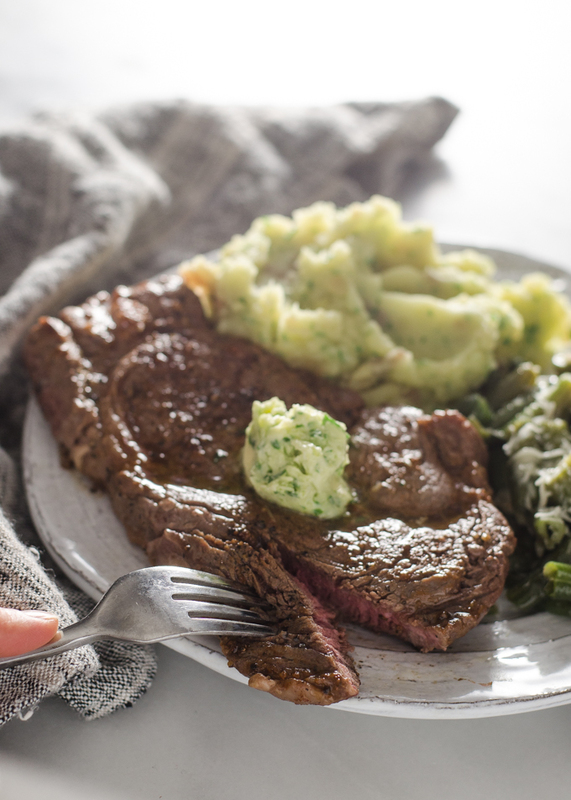 Hearty and satisfying. Something that was in my ButcherBox that I had never cooked with before was flat iron steaks. 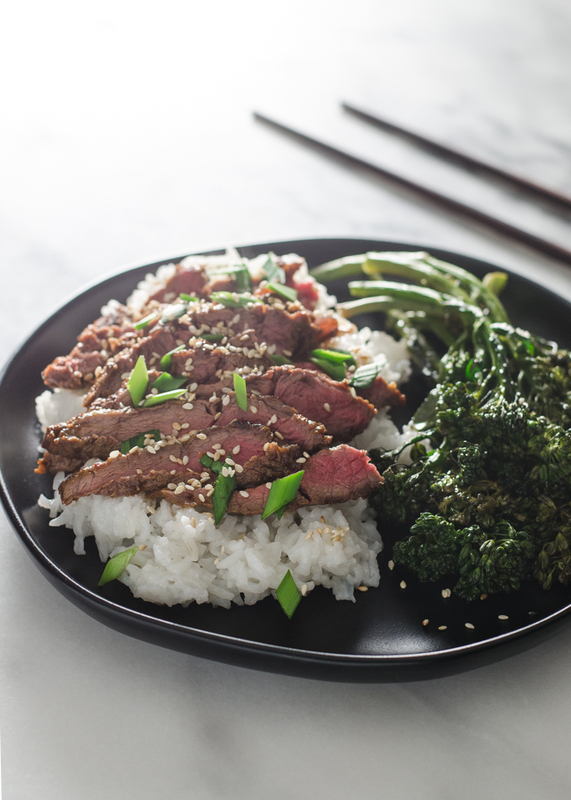 So I found a recipe for Asian flat iron steaks (I subbed an Asian pear for the honey to be SFJ compliant), cooked them up, and served them with rice and broccolini. Wow. These were the most buttery steaks I’ve ever cooked. Very very good. 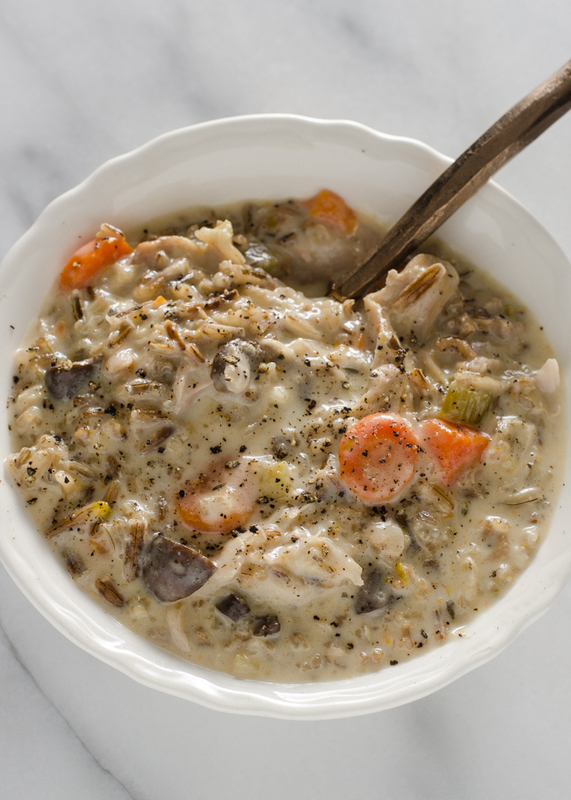 With part of the chicken thighs, I made a huge batch of Instant Pot chicken wild rice soup. So yummy! I froze half of it for when the baby arrives. 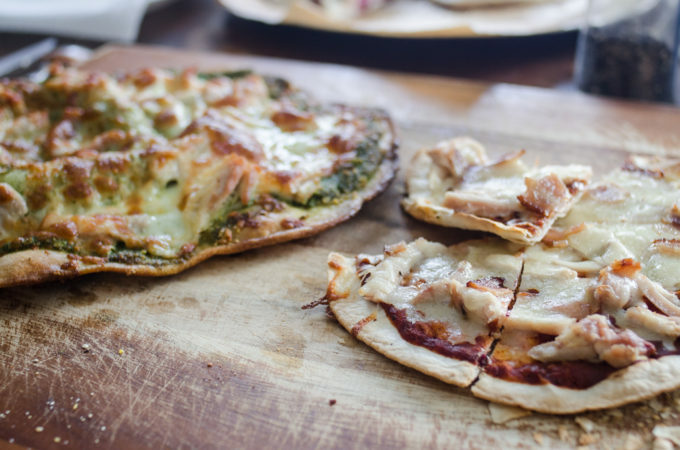 I made homemade chicken pesto and chicken BBQ pizzas with the remaining chicken thighs. I also froze 2 pizzas for when the baby comes. I’ve seen people raving about how good salmon cakes are, so with the remaining salmon that’s what I made! Is served them on top of rice with a side of mango salsa and a dollop of mayonnaise (not shown). These were SO good! Definitely something I’ll be making again and again. I also made a couple of breakfasts for myself with some leftover salmon: Omelettes with brie, salmon, and capers. So good! 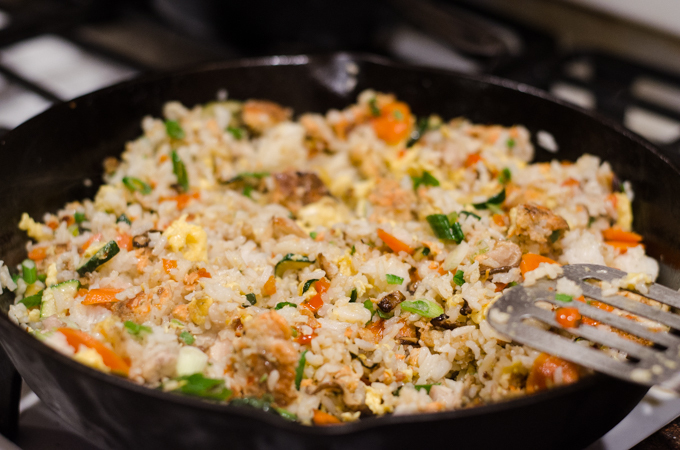 I really enjoyed cooking with my ButcherBox this month. One thing I love about it is the fact that I’m forced out of my comfort zone into cooking with cuts of meat that I normally don’t reach for. I can’t rely on the good old standbys that I purchase again and again. We had some really lovely meals this month. One thing to note is that the salmon does contain a few bones, but this is pretty standard for salmon in my experience. And overall the salmon seemed very good quality and had a nice color. The steaks were 95% tasty and tender, with a few chewy parts here and there. But again, you’ll get that with pretty much any steak you buy unless you meticulously trim off any tendons by hand. The chicken was so easy to work with, and also seemed excellent quality. 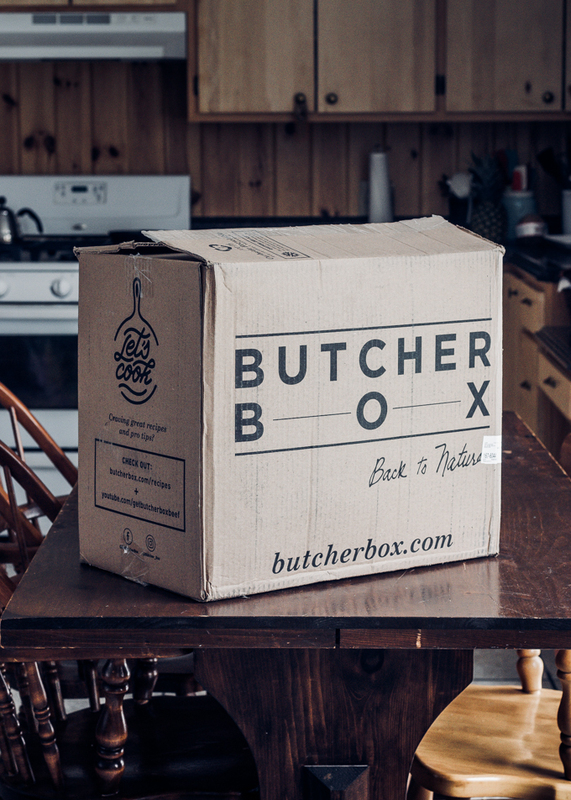 If you’re interested in giving ButcherBox a try, I highly recommend placing an order before the end of January. 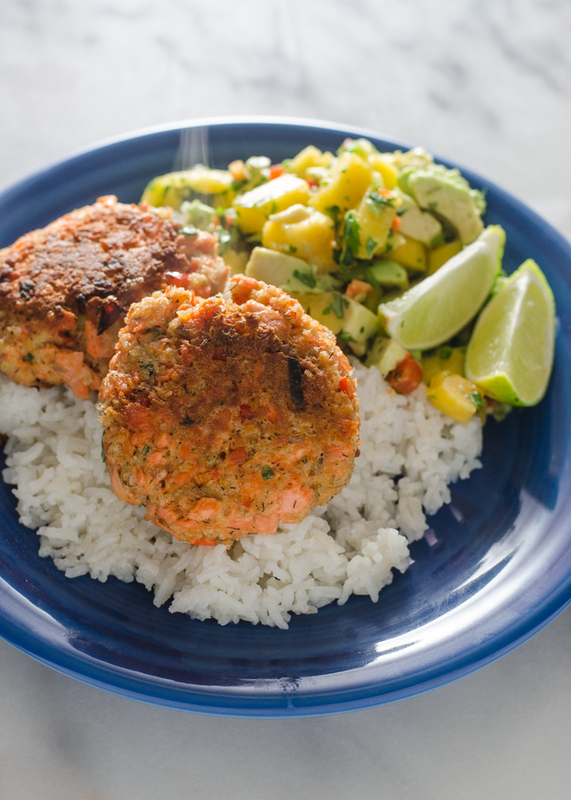 ButcherBox is offering you 2 pounds of wild-caught salmon FOR FREE. That’s a $39 value! If you’d still like to place an order after that date, you can still get $10 off your first box + free bacon by clicking here! 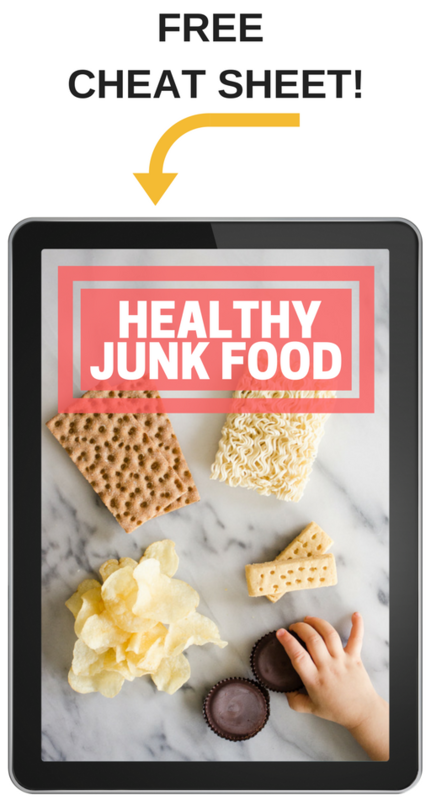 What a bunch of tasty looking meals you made! Yum! I’m so glad that you posted about Butcher Box again. I’ve been a customer of theirs for a few years and can vouch for the quality of their meats, as well. We usually get the beef only or their beef and pork box, which is a combination of their grass-fed beef and heritage pork. The pork is wonderful! My husband loves pork chops and theirs are cut about an inch thick. In December, BB sent me a pork shoulder and a pork roast, as well as a chuck roast. Like you, I like getting different cuts that I may not be familiar with and their recipes on site are very helpful. The only correction that I can see to your very helpful post is that they have changed their delivery to every month or every other month only. I’m looking forward to getting my salmon and my latest order of Butcher Box beef and pork! Good to know about the delivery options – I’ll update the post to reflect that! Thank you for your prayers – I really appreciate them!